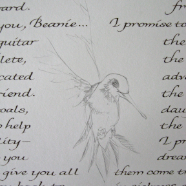 This was commissioned by the family of the wife. 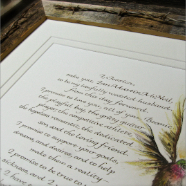 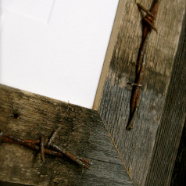 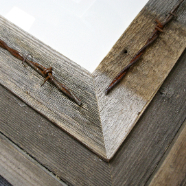 It focuses on the elements of the couple's wedding vows, the rustic, weathered frame, and the hummingbird (a favorite of the couple, who are described as "outdoorsy and down-to-earth"). 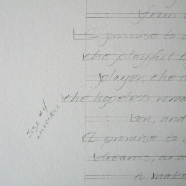 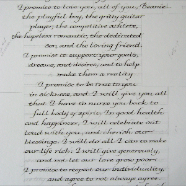 Walnut ink and brown gouache were used for the calligraphy and illustration, respectively. 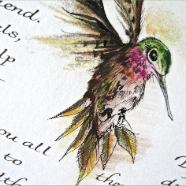 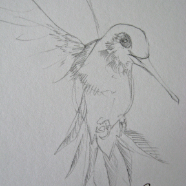 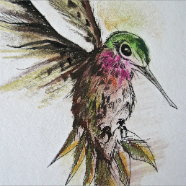 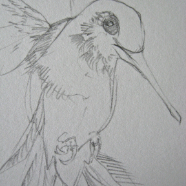 Pastels were used for the hummingbird coloring and to depict slight motion in its wings. 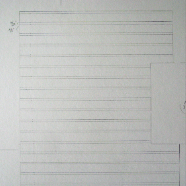 Size of the artpiece is 16" x 20"
Final size with matting and framing is 20" x 24"